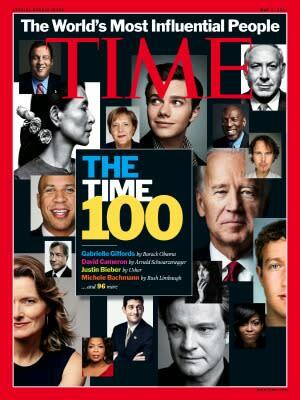 Time published its annual list of the world's 100 most influential people Thursday morning. In a year in which revolutionary uprisings have swept across the Middle East and North Africa--redirecting international attention and redefining influence-- several characters central to the Arab Spring feature prominently in the magazine's selections. "The Arab Spring represents a world historical cascade of events that is changing the Middle East. ... This year's Time 100 list reflects those stories," managing editor Rick Stengel writes in his letter introducing the magazine's latest honorees. "Large-scale changes occur only when great numbers of people become restive over time, just as people in the Middle East have been moved to shake off decades of ­authoritarian rule," Stengel's continues. He writers, of the role platforms like Twitter and Facebook have played in shaping the uprisings: "What social media have done is to make us all more aware of what's going on—and offer a new avenue to organize opposition. ... Now, because of social media, anyone can communicate with everyone. We're seeing that in the Middle East, Africa and China. The democratization of information may actually lead to real democracy." To that effect, Wael Ghonim, the 30-year-old Google executive who emerged as a powerful figure in the Egyptian uprising that toppled the three-decade authoritarian rule of Hosni Mubarak in February, is among Time's influencers. A dissenting Facebook page that Ghonim helped create was widely credited with galvanizing Egyptians and bringing demonstrators out into the streets in the hundreds of thousands earlier this year. "By emphasizing that the regime would listen only when citizens exercised their right of peaceful demonstration and civil disobedience, Wael helped initiate a call for a peaceful revolution," writes Mohamed ElBaradei, the Egyptian diplomat and Nobel Peace Prize laureate. "What Wael and the young Egyptians did spread like wildfire across the Arab world." In the case of Tunisia, whose popular revolt preceded Egypt's, a 21-year-old rapper known as El General was among those who ignited the revolutionary spark that led to the January ouster of President Zine el Abidine Ben Ali. Time has dubbed El General the "poet laureate of the pan-Arabic revolution." Fathi Terbil, the human rights attorney whose arrest in February is credited with setting off the uprising in neighboring Libya, made the list, as did Saif al-Islam Gaddafi, the 38-year-old son of Libyan strongman Muammar Gadhafi, who has vowed to help his father crush the revolution. Also honored is Major General Margaret Woodward, the three-star U.S. Air Force General who helmed the 11-day, U.S.-led military operations in Libya last month. "There's nothing new about women in combat--but a woman commanding others in combat has been a far rarer sight," notes Time's national security correspondent, Mark Thompson. The list acknowledges the role of those covering the uprisings as well. Among the Middle East media influencers is Ayman Mohyeldin, the Al Jazeera correspondent who "gave us front seats at the Egyptian revolution" and helped propel the Arabic news network to international acclaim. "All journalists hope that at least once in their career, they'll be covering the world's biggest story and be the best at doing it. With Egypt's revolution, Ayman Mohyeldin's hopes became reality," writes legendary news anchor Dan Rather in the Time feature. "He put us in the middle of the action and took us behind the scenes; he riveted us to the story as it developed toward its climax and kept us along for the aftermath. ... And for one brief, shining moment, he was the best in the world." A number of other prominent media figures unrelated to the Middle Eastern and North African tumult also appear on the list: Arianna Huffington, fresh off the mega-merger of her news and commentary website with AOL; Oprah Winfrey, who will concentrate full-time on developing her nascent OWN channel following the May 25 conclusion of her long-running syndicated talk show; Jennifer Egan, the journalist and author who just won the Pulitzer fiction prize for her bestselling novel, "A Visit From the Goon Squad"; MSNBC anchor Joe Scarborough; and Facebook founder Mark Zuckerberg.